First-half goals from Cesc Fabregas and Alvaro Morata earned Chelsea a comfortable 2-0 victory over Everton at Stamford Bridge on Sunday afternoon. 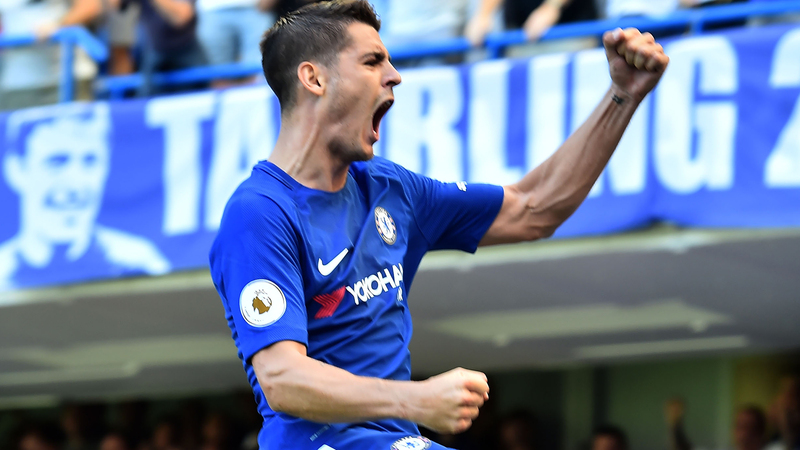 The Premier League champions opened the scoring through Fabregas' smart finish in the 27th minute before summer signing Morata headed home his second Premier League goal of the season five minutes before half-time. The result means Chelsea go into the international break on the back of two straight victories, after recovering from the disappointment of their opening-day defeat at home to Burnley. Everton: Pickford (6), Baines (7), Keane (5), Williams (5), Jagielka (5), Holgate (6), Davies (6), Sigurdsson (6), Gueye (6), Rooney (6), Ramirez (6). The home side dominated from the off and after forcing Jordan Pickford into early saves from David Luiz and Pedro they opened the scoring in the 27th minute with a goal that was both started and finished by Fabregas. The Spaniard, on his return from suspension, played a quick free-kick to Willian on the right flank before receiving the ball back and finding Morata in the area. The striker flicked it up and nodded it back into the path of Fabregas to smartly volley home with the outside of his boot. Antonio Conte's side deservedly doubled their lead 13 minutes later when Cesar Azpilicueta delivered a quality cross into the box and Morata evaded the attention of Michael Keane before heading beyond a stranded Pickford. Muhamed Besic was named on the bench for Everton, despite reports that his father was hospitalised after being shot in Bosnia on Saturday, and was introduced by Ronald Koeman at half-time to add some steel to their midfield. Eden Hazard was still not fit enough to make the Chelsea squad, but Pedro and Cesc Fabragas started. Gylfi Sigurdsson started his first Premier League game for Everton. And Everton enjoyed their first chance of the match five minutes after the break when Wayne Rooney, playing for the first time since announcing his international retirement this week, released Sandro Ramirez - only to see the Spaniard scuff his shot. Chelsea wasted a number of chances to score a third as Pedro fizzed a shot narrowly wide and Victor Moses shot straight at Pickford after finding himself in space in the Everton penalty area. The visitors enjoyed a flurry of late chances as Ashley Williams' speculative effort landed on the roof of the net and he then headed Gylfi Sigurdsson's cross narrowly wide, while Idrissa Gueye forced Chelsea goalkeeper Thibaut Courtois to tip a long-range drive over the bar. But Everton were ultimately second best as they suffered their first defeat of the season. Chelsea are unbeaten in their last 23 home Premier League games against Everton since a 1-0 loss in November 1994 (W13 D10). Everton have conceded 10 goals against Chelsea under Ronald Koeman, more than twice as many against any other opponent during his tenure at the club. Alvaro Morata is the first player in Premier League history to both score and assist a goal in each of his first two home games. In fact, both of his goals have been scored with his head and both assists have been headed passes. Everton had three touches in the opposition box before the 85th minute in this match - in the final five minutes (and injury time) they had four. Fabregas and Morata will make the headlines after scoring the goals, but Willian's energy, industry and creativity were crucial to Chelsea's success. The Brazilian dovetailed brilliantly with Pedro behind lone striker Morata and the Everton defence struggled to contain his runs all afternoon. He made four key passes in the game - more than any other player - and only a goal was missing to complete his performance. Conte will hope to welcome back Eden Hazard after the international break, but he will have a tough decision to make over whether to start the Belgian ahead of the in-form Willian. Both sides have a two-week break before their next fixtures. Chelsea travel to Leicester on September 9, while Everton host Tottenham on the same day. Whose squad will Ross Barkley be in by the time that match kicks off?